“Justin Finlayson, the founder of United Borders, is a well-known local music producer who grew up in the diverse London borough of Brent. He refers to his hometown, Harlesden, as the Wakanda of the day due to its visible and prevalent Afro-Caribbean culture. However, over the last few years, reports of rival drug crews and local gang warfare have caused deep divisions among the area’s young community”. United Borders is the first youth project of its kind. A cross-border initiative between Hyde housing association and Catalyst housing association, it was started in August 2017 as a way of bridging the divide between the Stonebridge and Church Road estates. However, finding the right location initially proved challenging. 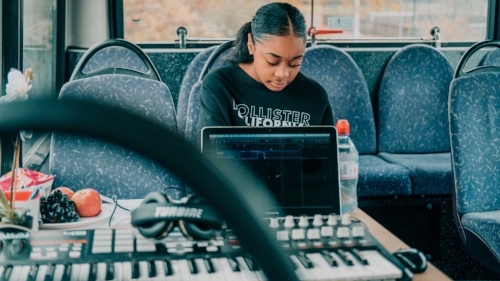 To avoid hosting it in one crew’s ‘no-go’ area, Justin decided to set up the programme on a double-decker bus, which he then converted into a makeshift music studio and classroom. In the mornings, he would drive to Church Road, before moving onto Stonebridge in the afternoons”. That sounds like such a brilliant idea. There are plenty of buses going spare – more than enough for this project at least – and it can freely drive between boroughs and near estates and reach people who are cut off from colleges and educational facilities. There is a mobile booth/studio set up on the upper-deck of the bus and youths have been getting involved and learning about music. 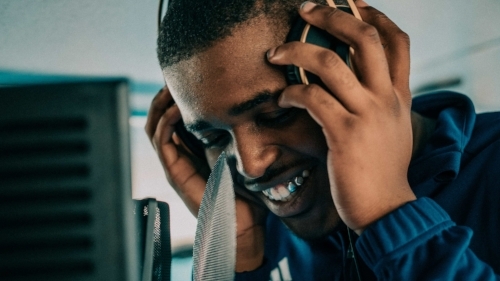 Whether laying down tracks or understanding production; they are being given a creative outlet where they can learn new skills and join like-minded peers. Youths from Church Road, at first, were getting off after the morning but many remained put and travelled to Stonebridge. “So why does he believe that music can help? What makes it such a powerful unifying force for the area’s young people? “Music is the soundtrack for life,” he says. “It doesn’t matter the age, gender, culture or environment. Most people utilise music to relax, escape, enhance or create – and this is no different with our young people today”. There has been talk and accusation in the press that Grime and Drill artists like Stormzy are actually encouraging killings and spurring on this violence. The biggest consumers – tragically or ironically – of that music is the white middle-classes and they are not the ones being blamed for the violence. A lot of the young black kids who the music is aimed at is not being consumed as voraciously by them then others – one cannot accuse music for encouraging violence and making it seem cool. “The youth believe they are being deprived of the opportunity to excel and that the educational system has failed them. Justin believes that the educational system hasn’t just failed our youth but has failed us as adults too because we are only churning out younger clones. The answers for tomorrow require a different value system from the system which has created the vast inequality we see today. We need an education which doesn’t value violence because we can profit from it. Justin said, “If younger people are given the trust to devise the education which can be a benefit to their generation then that work must start with a younger demographic. We can still learn things in a traditional way but it can’t come at the cost of todays world which is vastly technological. For starters, should we be allowed to profit from anything which impacts our environment negatively? These are the sort of questions I hope tomorrow’s generation can ask without any government opposition or argument”. Maybe it is a bit simplistic to say music alone can cure the problems of gang violence in the country. There is a lot of anger in certain communities and maybe musical primal scream therapy would be better?! Maybe some Primal Scream would help?! I think teaching a lot of disaffected youths production and recording techniques is a good idea but exposing them to all sorts of different music is another possibility. I do not feel any genre of music is responsible for violence and crime but it is easy to get hooked on a particular genre that, they feel, speaks for them and talks about their lives. There is a wealth of wonderful music out there and it can be eye-opening being exposed to all these different sounds and artists. Therapy, whether through a bus or providing a convenient and safe space for youngsters is wonderful. It is clear that the Government is dropping the ball and unaware of the plight and struggle out there. Mayor Sadiq Khan has come under fire in regards the wave of stabbings in London but it is not right to put the blame on his shoulders. A lot of the issues stem from an imbalance in funding and seeing estates crumble and many of the capital’s young lacking any understanding and feeling like they are marginalised. “For Justin, music is just the start. He hopes to eventually persuade Brent council to defy government cuts and pour more money back into the community, ultimately giving more young people the chance to broaden their horizons. He cites his childhood as an example, where he was frequently given the opportunity to leave the capital and spend time at activity centres in the countryside. “My parents often say that if you were walking the streets in their era and saw somebody who was black, you’d instantly cross the road, greet them and walk together,” he adds, finally. “To see somebody who was black was seeing safety. How has Brent and the majority of the UK in the space of two generations, now seeing the reverse? To see somebody who is black, who looks like you is now a sign of danger”. Gang members – from both sides – are already recording members and collaborating gives them a chance to set aside differences and use that anger as fuel for great music. Funnelling illogical tensions and that gang mentality into a genuinely productive, inspiring and wholesome pursuit can actually be a long-term solution. The mentoring happening means youngsters are finding jobs and arming themselves for the employment market. Educated, better-informed and with new meaning in their lives, the mobile school that they can go to and feel enriched is brilliant. I hope the scheme rolls out to other areas/estates and money is set aside to ensure it is a continued success. Rather than loitering around shops and looking for ‘excitement’; they have somewhere to be and feel like they belong. Maybe leaning more on the musical side of things could kick-start something huge. Now, we are witnessing warring gang members conspire through song. Music in its simplest form, just listening to it, can be a calming and wonderful thing. Allowing youths from all around London a chance to bond over music and talk about their experiences through the lens of old and new music is a cheap and easy fountain. Music is the soundtrack to our lives and the link we all have in common. Providing musical education and allowing young people the chance to lay down some beats and a song is so crucial. IN so many people’s lives. FEATURE: Mind Over Body: Is There Pressure on Female Artists to Look a Certain Way and Have an ‘Ideal’ Body Size?